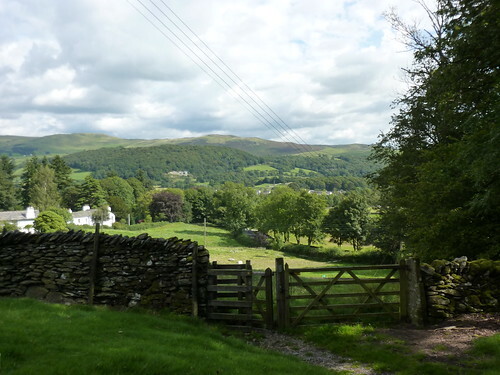 Where our never-ending wanderer heads towards the Lakes, sees some mighty fine views, loses a camera battery, finishes off the Dales Way and heads off for a celebration. Sort of. I was so early that the train for Oxenholme hadn’t even gone and I’d have to linger around on the platform whilst it popped down there and set back off again before I could get on it. When I did finally board after the agonising wait of, ooh, fifteen minutes, I did at least have the excitement of asking the guard to stop the train. Burneside is officially a request stop although it seemed busy enough the day before to wonder why it wasn’t a permanent one. I then had the added bonus that, despite the guard knowing I’d be getting off at the next stop, he seemed completely uninterested in parting me with my £2 fare, preferring to pursue people with luggage and suitcases instead. Naturally I put the saving to good use, spending it on a big bag of chocolate limes from Burneside’s shop. Hitting the Dales Way once more, everything started rather gently with a trip down the banks of the River Kent which seemed quite a long way from where you’d expect it to be. Dorset. The Kent is, by all accounts (by which, I mean, I read it in a book), one of the fastest flowing rivers in Britain but whilst it was certainly in a rush, I was content to dawdle. I had only ten miles left to do and there seemed little point in rushing. The path gently meandered along the river bank, at the edge of fields until eventually depositing me outside the village of Stavely. Ever the chatty one, Pete at YHA Kendal had informed me that Stavely had two great institutions not to miss, but which I’d probably miss as I’d be too early. And I sure was. It was 11am and thus far from ideal timing to partake in lunch at the famous Wilf’s Cafe, or pop in for a pint in the Hawkshead Brewery’s beer hall. I’d been looking for somewhere to rest awhile whilst eating my apple, but if Stavely had the handsome village green I felt it ought to have, I couldn’t find it, and instead I returned to the Dales Way and waved goodbye, promising to return for food and drink at a more appropriate time. It turned out to be a better decision than just perching on a bench at the end of a cul-de-sac as I found a superb spot near some cottages worryingly called “Moss Side”. Setting forth one more I found myself on a deserted tarmacked lane lined with wild flowers, sycamore trees and wild raspberry bushes, along with some of the largest and juiciest blackberries I have ever eaten in my life. I scooped them up by the handful as I walked along, thinking that if I owned the local farm, my kids would be regularly sent out to collect as many of them as possible! Traversing some more farms and popping along more lanes, I was taken up a grassy hill where the promised land was revealed. Lakeland was up ahead and I was presented with a beautiful view of the Coniston Fells. It was so lovely that I couldn’t think of anywhere better to picnic so I scoffed my lunch there and then, only to find an even finer view at Hag End Farm which had a huge, sweeping panoramic involving both the Conistons and the Langdale Pikes. It was an outstanding sight. 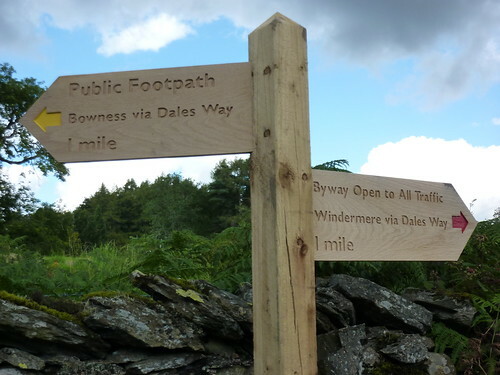 In a way I hadn’t understood why the Dales Way bothered going to Bowness-on-Windermere. After all, the Dales had ended some time before. However I was willing to sacrifice my puritan beliefs for something nice to look at. To make it extra special, it was a fine and warm day and whilst there were plenty of clouds, there wasn’t a rain filled one amongst them. I was now close enough to Bowness that I was being regularly passed by day walkers doing a circuit from the town. They were the first day walkers I’d seen for some time. But for me the journey was nearing an end. A signpost for Bowness proclaimed it was now a mere mile away. I passed through my final set of sheep farms, and helped myself to a delicious organic, hand-picked apple from a basket conveniently sited near a gate and a bargain at 10p which no doubt went straight into the pocket of some ten year old. It was amazingly sharp, crisp and juicy and certainly well worth the dosh. And then there I was. In front of me was the bench that marked the official end. There was nothing more to do but have a sit down. 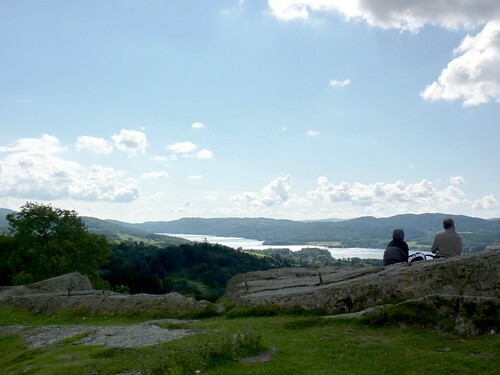 By a stroke of genius the Dales Way’s creators had planned it such that you didn’t even see the mighty Lake Windermere pretty much until you sat down and rested, which seemed a fitting reward for the effort. I sat down and slowly realised it was all over. Oh and that I appeared to have lost my spare camera battery. Down there was the lake. And thirty quids’ worth of electronic power was sat somewhere on a hill behind me. It was barely two o’clock – an insanely early time to end. Staring at my map I noted there was a view point on Brant Fell not far away and given how many people were heading in that direction, it must be worth a look. Following the signs I found a viewpoint which was, frankly, abysmal. A tiny gap in the trees looking out at a minuscule slice of lake. Disappointed I dutifully followed the path round in order to head to town, only to spot a more promising option highlighted by a small sign. Whilst there was no official right of way to the top if Brant Fell, there was permissive access to the summit and that was where everyone else was heading. 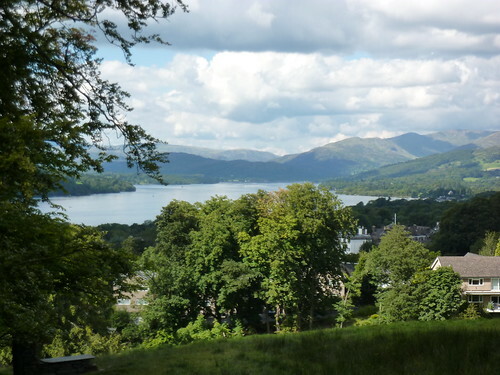 It wasn’t a major fell – a mere 192m above sea level – however the view to the north and south of Lake Windermere, surrounded by fells and trees with the water glistening in the sun was breathtaking. It was a superb finale and I sat on a rock taking it all in and feeling very happy. Suddenly I felt satisfied. This was a true climax to a journey. A brilliant end to the tip, and in good spirits I felt content to head down and face the crowds filling the town on that hot August afternoon. I’d originally had grand plans of taking in a lake cruise or some other exciting celebration, yet it was a simple sign that revealed what I had to do next. “The Official Finishing Pub of the Dales Way” it proclaimed and before I knew it, I was sat outside with a pint of Coniston Bluebird feeling very relaxed indeed, and admiring the power of advertising. I would have checked into a nearby B&B that proclaimed to welcome Dales Wayers had I not pulled myself short and remembered I’d already got a bed booked. Bowness is a busy place and frankly I hadn’t expected anyone to really give a hill of beans about some people who had come eighty odd miles from Yorkshire so two small signs really made me feel welcome in a strangely pointless way. But then I’ve always felt that a sense of completion, an element of recognition, is necessary at the end of the walk. On completing the West Highland Way a few years earlier the walk ended with a mile and a half route march up a main road before coming to a stunning finalé at a roundabout. In contrast the North Downs Way used to end in a market place; the end commemorated by a small sign surrounded by bored teenagers. And when I arrived in Carlisle having just done the Cumbria Way, I found myself popping open the champagne next to the local bin lorry depot. Each felt a bit of an anticlimax. OK so few of the people bustling around you care about what you’ve done. If I’d turned up at Bowness and shouted “I’ve just walked from Ilkley!”, chances are that I would have been greeted by plenty of blank looks. Maybe someone would ask me about my hat if I was really lucky. Or mutter about having just walked from the bus depot if I wasn’t. True, two businesses putting up signs doesn’t provide a stunning end to the Dales Way, however in such a busy place, full of tourists, it was nice to see someone recognised the achievement. And with my pint supped, I headed to the lakeside for an ice cream and my plan to end the day in style. 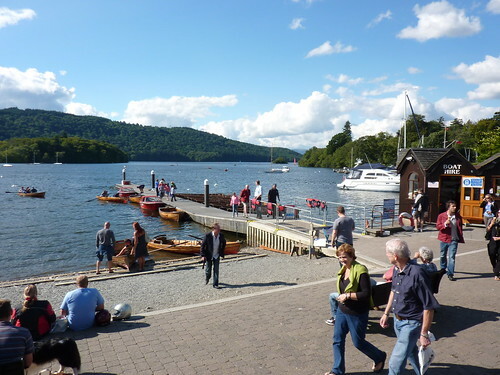 Windermere is a horrendous place to try and get a bed, especially if you want to stay just one night at a weekend. In 2008 I was invited to a wedding on a Friday. Catherine had a prior engagement in London the following day so we couldn’t stay for long. Even in April, it was a struggle finding anywhere that would take a one night booking. With that in mind, I’d booked myself into Windermere Youth Hostel without hesitation. The YHA, thankfully, have none of that nonsense. As I walked past endless B&Bs displaying “Vacancies” and even “Special Discount Rates Tonight” (amazing on an August Bank Holiday weekend), I mused on the one snag with my plan: the hostel was a few miles out of the town. I’d tried in vain to find any public transport to the place, and I’d resigned myself to a long walk to get there. It was Pete at YHA Kendal who had come to the rescue by telling me there was actually a bus that would take me most of the way there. The 599 ran every twenty minutes. Oh and it was open top! 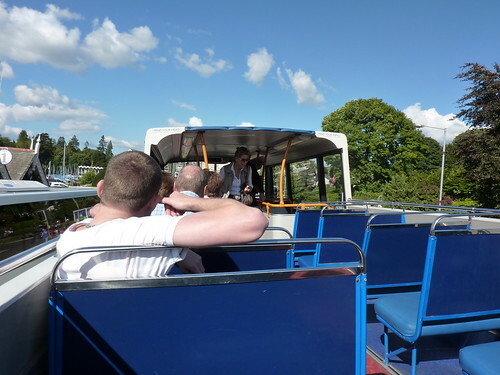 There’s just something about open top buses that are amazingly exciting. I clambered up on to the top deck and watched my fellow passengers board, all of whom were sporting huge grins. Being hit by overhanging tree branches as you drive down the road is never so much fun. Arriving at the hostel, I found myself in a small dorm sharing with three Japanese students and fended off questions like “Which is more popular in London? Rugby or football?” whilst I polished my boots. Later, having having partaken of a nice meal, I sat and looked back on it all. It had been a cracking journey with some lovely scenery, delightful rivers and an ending that was truly stunning. 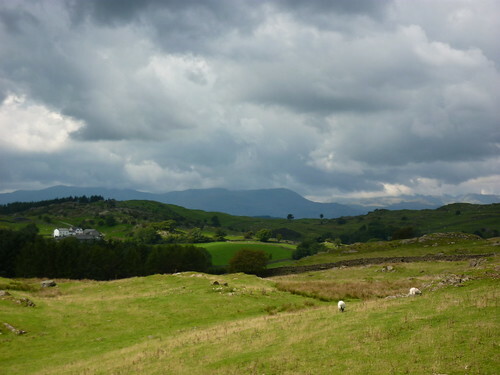 Gentle it may have been on the feet, but the Dales Way was a joy to the eye. I sat and smiled, before looking at my empty glass. One more celebratory beer? Hmm. Yes. I think so. First Published: 19 January 2011. Last Updated: 18 November 2015.